We've all seen cheesy pastoral murals on the walls of restaurant bathrooms, and I think we can agree that there is nothing sophisticated or elegant about those. But lately I've spotted a lot of very clever and charming takes on trompe l'oeil which have made me reevaluate the concept. 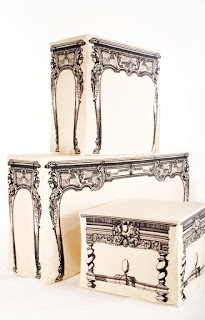 It's a cheeky and sassy way to bring old-school elegance into a modern space, and typically a lot cheaper than the real thing would be! Look at these amazing tablecloths from Mark Cutler- easily turn a junky old table into a work of art. 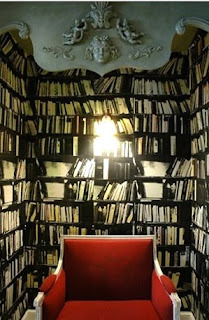 I also love this wallpaper from Deborah Bowness- if we didn't have so many real books I would cover our whole apartment in it. 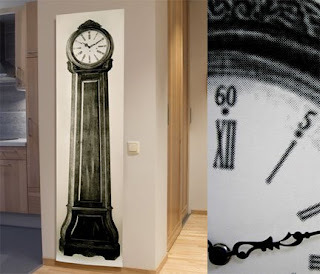 I fell head over heels for this "Grandpa Clock" from Dutch by Design. So cute and practical. Lastly, I pulled this page out of Domino last year and have hung onto it since then. 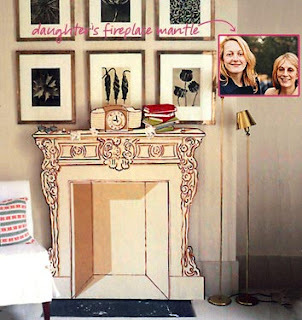 What an ingenious way to create a beautiful central focus-point in a room without a fireplace. And you can take it with you if you move! Those tricky tricksters.